Mobile phone detectors are to be used by police to find drivers using devices at the wheel. A sign will flash at the driver telling them to stop using their mobile - but the detectors cannot tell if it is a driver or passenger using the phone. The mother of Aimee Goldsmith, 11, killed by a driver using a phone, said it was a "step in the right direction". The technology will not be used as an "enforcement tool", the forces said, but was instead aimed at educating motorists and identifying offending "hotspots". Kate Goldsmith's daughter was one of four people killed in the crash when lorry driver Tomasz Kroker was using his phone at the wheel in 2016. She said Aimee's death was "completely avoidable". "Most mothers look forward to planning their daughter's weddings. I had to plan Aimee's funeral," she said. Ms Goldsmith said she had confronted drivers using their phones behind the wheel since her daughter's death. "I have stopped a few people and said, 'you're using a mobile phone - it's actually a driver like you that killed my daughter'," she said. She said the detectors were "not a perfect solution" to convict offenders but were "a step in the direction". Kroker killed Aimee, her stepbrothers Ethan Houghton, 13, Joshua, 11, and their mother Tracy, 45, when he ploughed into stationary traffic at 50mph on 10 August 2016. He was jailed for 10 years after admitting four counts of causing death by dangerous driving and footage showed him on his phone at the moment of impact. A judge said the 30-year-old's attention had been so poor he "might as well have had his eyes closed" before the crash on the A34 near Newbury. Thames Valley Police and Hampshire Constabulary have developed the technology with Westcotec Ltd. 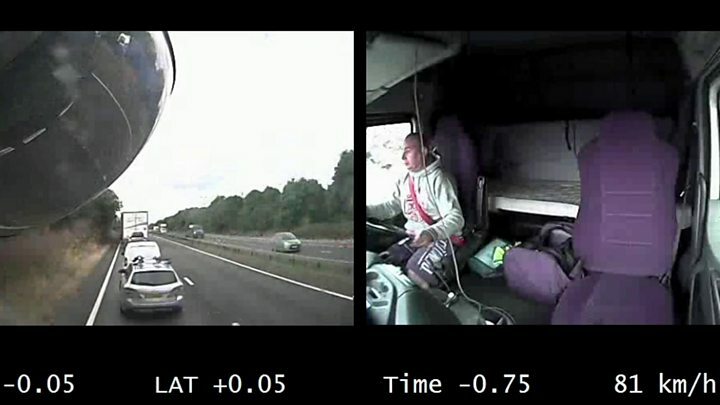 The system, which cannot record footage, was initially tested in Norfolk last year. The detector picks up 2G, 3G and 4G signals and will therefore flash to alert people in cars who are using phones to call, text or data. If people are using a Bluetooth hands-free device, the detector will recognise this and not flash. The technology cannot distinguish if a passenger or a driver of a vehicle is using a phone and so the sign will be activated regardless of who is using the mobile. The forces say the two detectors, which cost £6,000 each, will be located on the A34 in Oxfordshire but will be posted at different locations throughout the Thames Valley and Hampshire to start - but more could be rolled out. Drivers caught using a mobile phone while driving are currently fined £200 and given six points on their licence. Matt Barber, deputy police and crime commissioner for Thames Valley, said the system was "not fool-proof", but added the police needed to "make it as socially unacceptable to use your mobile whilst driving as it is to drink and drive". PC Liz Johnson, a roads safety officer, said research suggested a driver was four times more likely to crash if they were using a phone and twice as likely to be involved in a fatal collision when texting compared with drink-driving. "It is vital that people take notice and stop using their mobile phones whilst driving," she added.